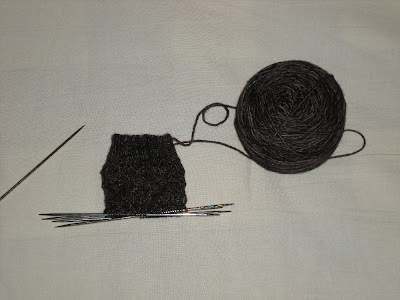 This week I have neither a finished object nor a frogged project. What I have instead is a plan. 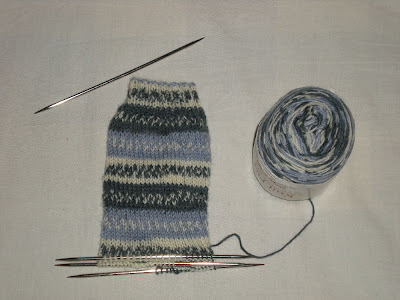 My plan is that during February, I will have a finished object each Friday. I think I can do it! After finishing Pea's sock's last week, I pulled out a long standing WIP that hadn't been touched in months. My Hypoteneuse Stole. 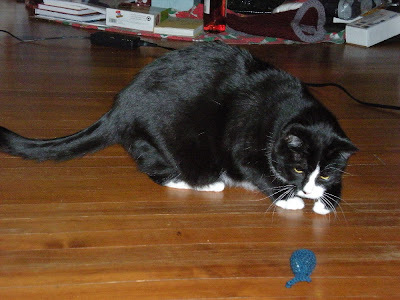 I've been working on it exclusively, and this morning I finished the third ball of yarn out of five. I doubt I'll have it finished for next Friday, but I've got something small I can finish up instead. And hopefully, the Friday after that, Hypoteneuse will finally be done! 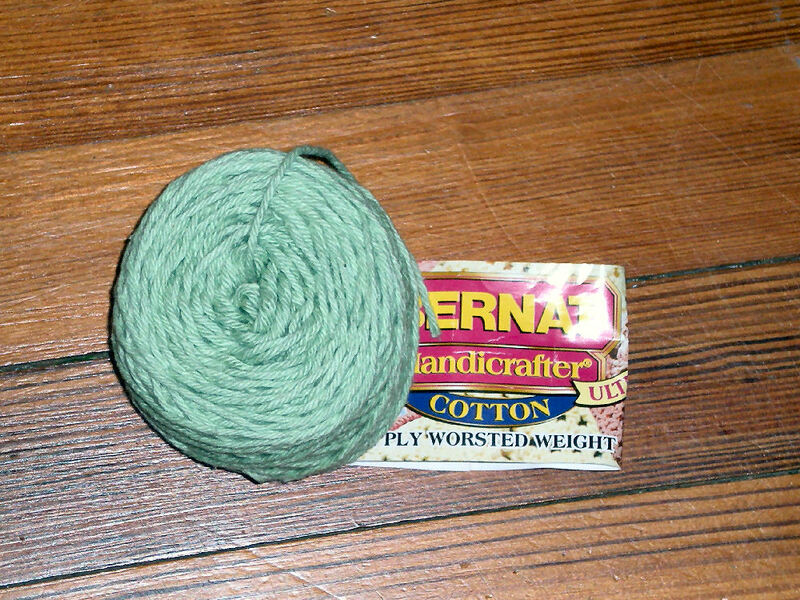 FREE yarn in the mail, of course!! 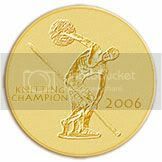 Last month I entered a little contest over that the KnitPicks blog. It was really quite easy. All I had to do was leave a comment telling them which of three patterns from the Winter Knitty I'd be most interested in knitting. I left my comment and forgot about it - until I received an e-mail informing me that I won!! This is destined to become Amused by Jordana Paige. "Ooooh, this stuff is soft." "Please, paparazzi, no more photos today." "Modeling is very hard work." So yes, my stash is now even larger. But this addition comes along guilt free! Thanks, Knit Picks!! Yesterday morning, my brand-new, super-duper laptop arrived . . . just as I was getting out of the shower. (Sorry Mr. Fed-Ex Man.) I spent all day getting it set up, and ran out of steam before I got my Finish or Frog post done. But since I actually did finish something this week, I figured it would be okay to post it, even if it is a day late. 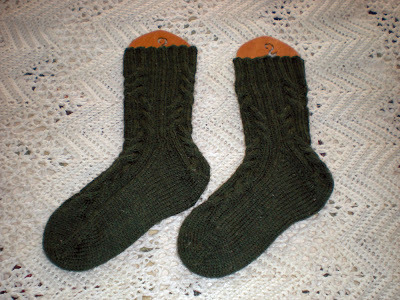 This week, I finally finished the socks I was knitting Pea for Christmas. Pea loves his new socks (even if I couldn't get him to model them for the blog). He says they are soft and cushy, and very warm. This is such a super speedy and fun pattern. (No comment on why a super speedy present was gifted so late!!) 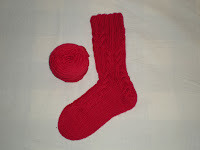 Which is good, because my Log Cabin Socks are still in my WIP list. Look for those on a Friday soon! It's Finish or Frog Friday once again. 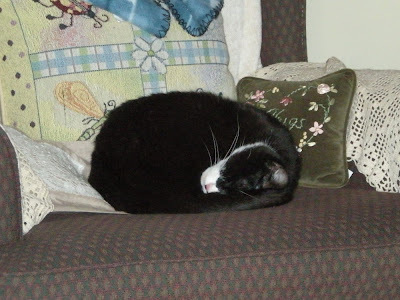 I hoped to have a finished item today, but it's looking doubtful. Rather than spend the day stressing over it, I decided to go ahead and frog something this week. Can you guess what's getting the axe? 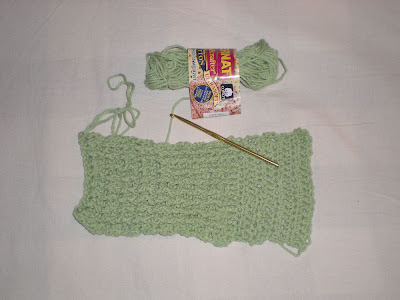 I started this project when another urge to teach myself to crochet hit. I figured a Swiffer cover was a good choice, because if my stitches were sloppy (which they are) it really wouldn't matter much. After all, I was just going to use it to mop the floor. 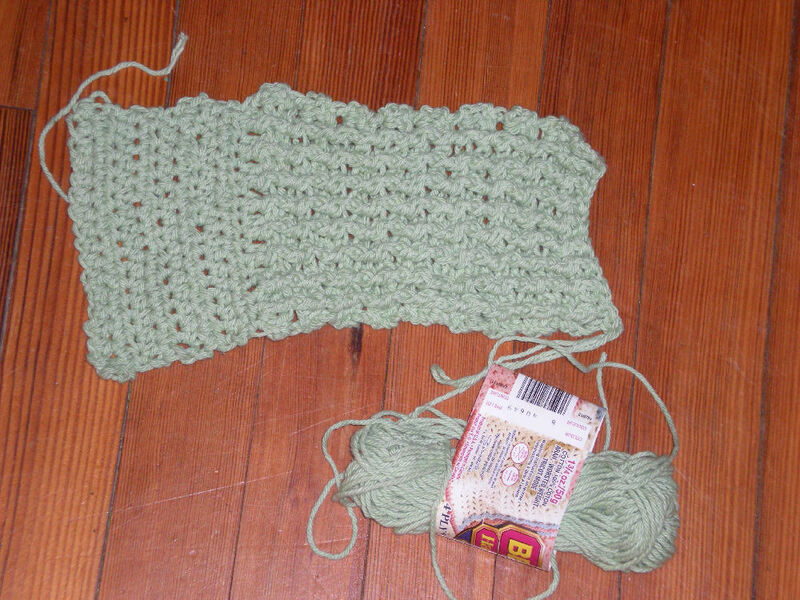 I do feel that I've finally gotten a grasp on how to crochet. I even learned a couple of "fancy stitches". But in the end, the love is gone on this project and I have no desire to finish it up. Quite frankly, the stitch-work is so uneven and ugly, it's an embarrassment to crafters everywhere. Farewell, little project. Back to the stash, ball of cotton. I have a feeling you'll be reincarnated as a wash-rag some day. Since I've joined Finish or Frog Friday, I figure it's about time I confess to all of the WIPs I have going on. Beware, this could take a while. Some of these I may never even have blogged about. In the interest of keeping some small shred of self-respect, I won't get into many details today. I'll just tell you what they are and maybe when they were started. Yes, they look the same, but one is bigger than the other. They were going to be Christmas gifts . . . hahahahahaha. 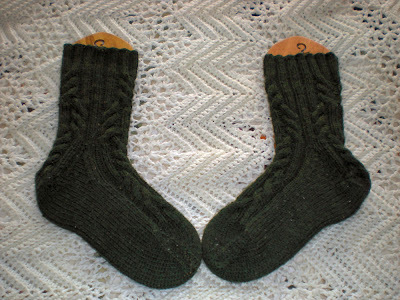 Two pairs of Log Cabin Socks from Handknit Holidays. 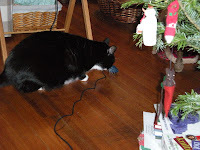 One is a Christmas present for Pea . . . hahahahahaha. One is mine, started in November. 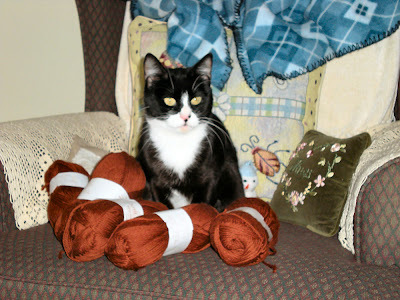 Biffer Shrug, a crocheted swiffer cover. 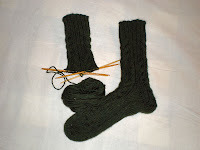 A pair of stockinette socks (my own basic "pattern"). Started in July, still working on the first one. Shut up. This is the Malabrigo I won at Stitch 'n Pitch in June before it was available for sale. Cast on in June too. Shut up again. Oh gosh, I started this last February, after Charlie died. Someone slap me! 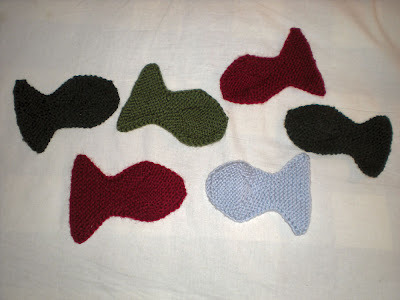 A fish blankie for worsted scraps. Because I can't throw away perfectly good scraps of yarn. 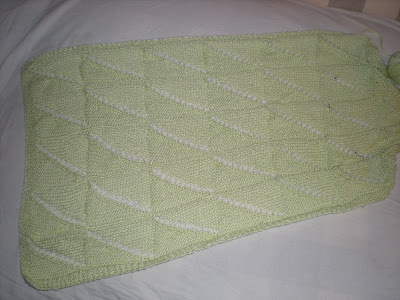 Another blankie for sock yarn scraps. 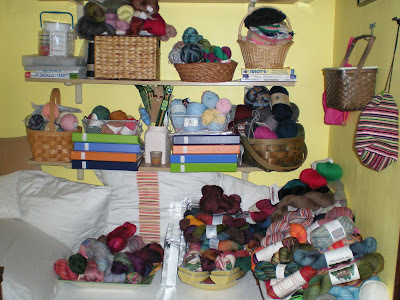 And I certainly can't throw away sock yarn!!! Yes, that is 10 projects. Good thing I joined Finish or Frog Friday! I just signed up for Twitter. 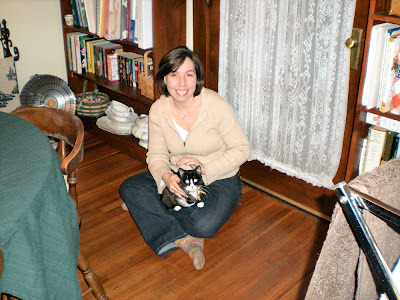 It looks like it's going to be a lot of fun and a quick way to keep in touch with my bloggy friends between posts. I'm slowly adding friends (or what ever you call them on Twitter), but for now they are all diabetes pals. 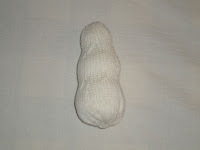 So, any knitters on Twitter? Let me know so I can add you. I'm Karen_mst. I belong to the Knit Picks e-mail list. 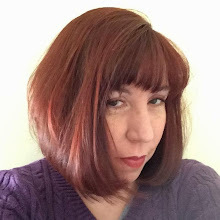 Actually, I belong to a bunch of yarn and knitting e-mail lists, because I like to keep up on the latest sales tips, tricks, cheap yarn and patterns and yarn specials. 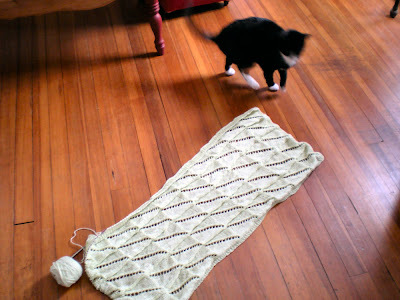 *ahem* Anyway, recently one of my Knit Picks emails arrived. It linked to a video tutorial on speed knitting. I clicked over to watch it . . . . but then I closed out before it even loaded. You see, I'm torn on the idea of speed knitting. On one hand (or perhaps "one needle"), the idea is very appealing. There are so many things out there that I want to knit! I think about starting and finishing a sweater before the heat of summer hits. I imagine actually knitting a pair of socks each month. 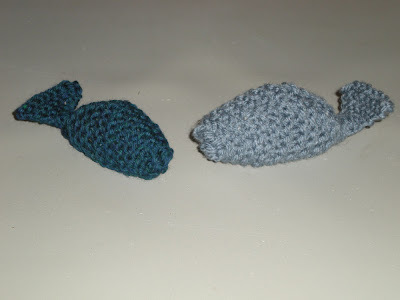 I dream of cranking out little things like mittens and cowls and hats (oh my) when ever the mood strikes. It all sounds pretty great. But then I thought some more. I thought about what knitting really is to me. A process. Something relaxing (most of the time) and enjoyable (usually). Do I really want to turn knitting into a quest in which I must go faster and faster? I push myself an awful lot. My house must be spotless. My dinners must be scrumptious. My diabetes must be in control all of the time (which is impossible, but that doesn't stop me from beating myself up on those inevitable bad days). I put a lot of pressure on myself already. How happy will I be if I now pressure myself into speed knitting? Not very happy, I think. I want my knitting to be something I look forward to. Something that releases the pressure. Something I enjoy. Even if it takes me two months to finish a pair of socks. Or almost a year to knit a sweater. I can live with that. I feel so proud when a project gets finished. Wouldn't that pride fade if I was churning out projects right and left? I suspect it would. 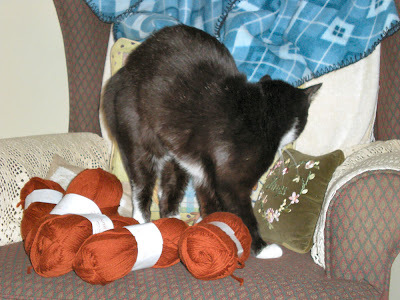 The one opinion I don't want about speed knitting comes from my stash. 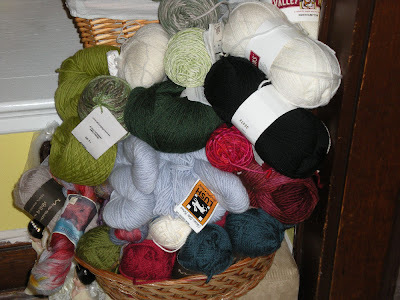 The lace-weight, cotton, baby yarn, wool and sock yarns. 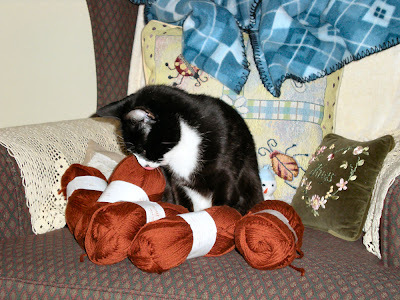 Or the pile of worsted skeins. 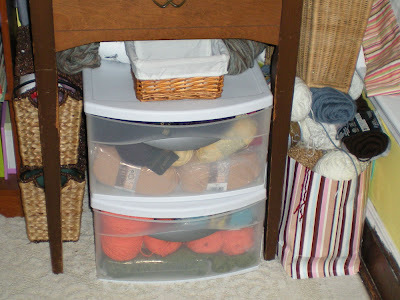 Or the bin of sweater yarns, sandwiched between more baskets of lace-weight and a big bag of acrylic. If you ask them, I don't knit fast enough. They worry that I could never live long enough to knit them all. They may have a point. But I think I'll knit at my own pace anyway. What are your thoughts on speed knitting? Are you inspired to give it a whirl? Or do you find it a stressful thought, like I do? Sadly, our little kitty house guests had to go home yesterday afternoon. They were the best guests we've ever had and we were so sad to see them go. (Okay, yes, I did cry a little after they left.) To help them remember the fun we had over the past two weeks, I sent them each off with a little gift. 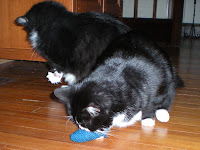 I stuffed them with fiber-fill and quite a bit of cat-nip. I'd say they were a big hit. 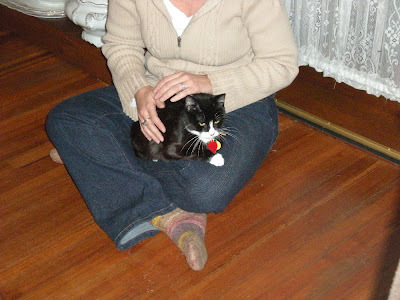 The crazy kitties chased them all around the house, until we finally had to pack them away so they could take them home. 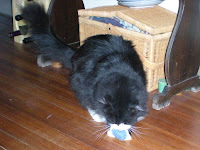 After they were gone, I spent about two hours getting the house cleaned up and un-kitty-proofed put back in order. From the amount of hair I vaccumed up, it's a wonder they didn't go home bald! (Thank you, Mr. Rox the Long-Hair). 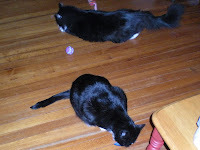 It may be much neater and cleaner here now, but I can't stand how quiet it is without those two fuzzy bundles of love. Looks like it might finally be time to find another little kitty who wants to come stay here forever! 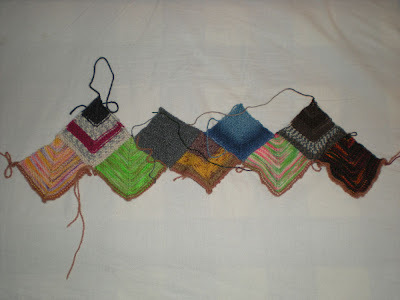 Jennifer over at Major Knitter has started a new KAL for 2009 called Finish It or Frog It. On Fridays you take a good look at what's on your needles (and in the bottom of the WIP basket) and make the choice to finish it or frog it Then you post about it on your blog or in the Ravelry group. You don't have to do it every Friday, but I think it's a great idea to get into the habit of evaluating my projects every week so they don't spin out of control. So, to start the year off right, I decided today would be a Finish It Friday. 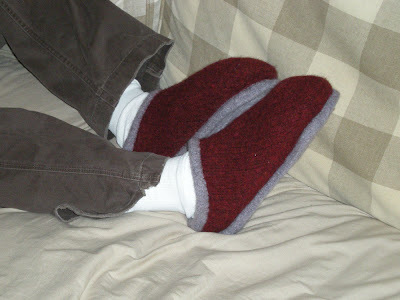 I buckled down and finished the Felted Clogs I was making Pea for Christmas. 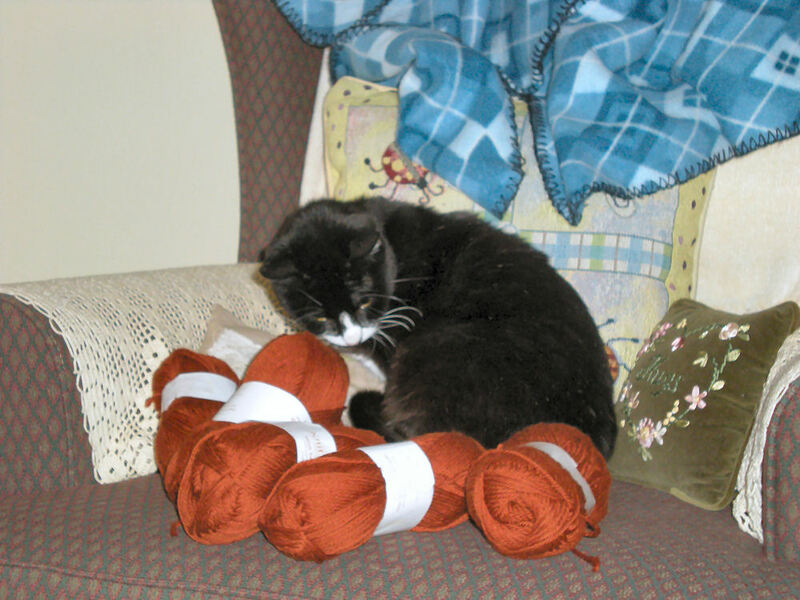 And then, I even felted them and put them through the dryer! Perfect fit. 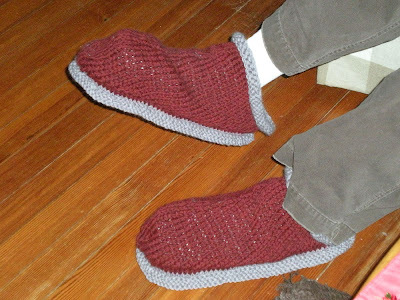 We even threw away the last pair of slippers I had knit him, since the soles had holes so big his foot fit right through. 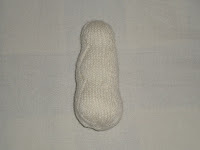 And next Friday, hopefully I have another knit finished to show you! This KAL is just the inspiration I needed. If you need a bit of inspiration too, let Major Knitter know you'd like to join us!